In recent years, there have been a lot of books and blogs put out on how to become happier. But what if searching for happiness actually results in unhappiness, and to get happiness we need to be looking for something else? Life is not a quest for pleasure or a quest for power primarily, but a quest for meaning and Happiness is not a goal but a by-product. To be honest, search for meaning in life may arouse inner tension/stress rather than inner peace to start with. However, precisely such stress is an indispensible prerequisite of mental health. What we actually need is not a tensionless or stress free state but rather the striving and struggling for a worthwhile goal, a freely chosen task, a task that we love. For instance, on Sundays when the rush of the busy week is over and the void within manifests, it makes us aware of the lack of content in our lives. We crave for free time, personal space but the pity of it is that many of us do not know what to do with the acquired free time, throwing us in a state of existential frustration. So, instead of looking for happiness, look for something that gives you a sense of purpose leading to fulfillment. People who feel ?a sense of belonging? – in their family, community, school, or elsewhere – tend to believe life is more worth living. It’s richer. Similarly, people who say they’ve found their ?purpose? more often view life as fulfilling as they are least likely to be affected by boredom since they have something to look forward to every morning. However, that purpose tends to be fulfilling mainly when it involves being selfless. The key to purpose is using your strengths to serve others. ?There’s more to life than being happy, so stop being ashamed of being unhappy, find your purpose and have a fulfilled life?. 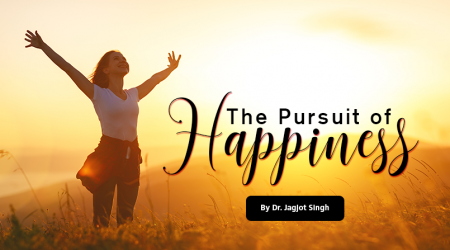 Posted on September 20, 2018 by Dr. Jagjot Singh. This entry was posted in Mental Health. Bookmark the permalink.